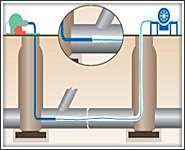 The lining systems we offer proven and established methods of placing a new pipe within an existing damaged pipe without excavation and with minimal disruption. The new pipe material is similar to GRP (glass reinforced plastic) and in all cases will be superior in quality and strength to the pipe which it lines. 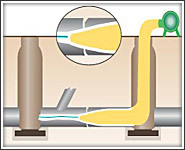 The new pipe is molded into the damaged pipe by an ingenious method called 'inversion' using water or air pressure, fitting it tightly against the wall of the existing pipe. 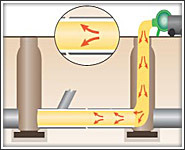 When the inversion is complete the new pipe (which is originally flexible) is now rigid, resulting in a strong, tough pipe tightly fitted within the existing pipe with only a minimum loss of cross section of approximately 6%. 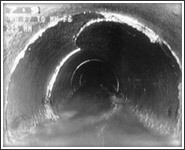 The liner is manufactured from a special dense impermeable felt and is designed and tailored to fit exactly the internal dimension of the pipe to be refurbished. The thickness of the lining material can be varied according to design specifications required. A special resin containing an activating catalyst is impregnated into the liner pipe prior to installation. 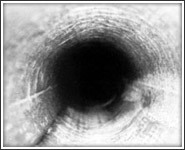 lining is suitable for sewers and vertical rainwater down pipes etc, 75mm - 1000m dia. The liner is resistant to most aggressive chemicals and can withstand extremely high temperatures. A full technical specification is available upon request. Hydro Jet Engineering can offer a wide range of “No Dig” Solutions to our clients Such as ambient cure, hot cure, Part liners & High Strength UV Cure sewer lining. 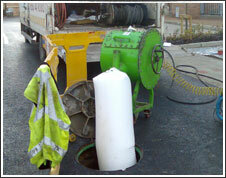 The Advantages of sewer lining by Hydro Jet Engineering. The customer will benefit from the lining repair process in many ways. • Eliminates costly excavations and general disruption to the property. • Suitable for domestic, industrial, commercial and municipal applications. • Achieves permanent structural repair. salt glaze, clayware, concrete etc. • Any cross-sectional loss is adequately compensated by increased flow efficiency. • Minimum lengths of 0.5 of a meter can be installed for a local structural repair. existing pipe for its structural integrity. • A lining refurbishment will be ready for use within hours of installation. • Superior quality at lower cost means good value for money. The liners conforms with European Standard BSEN13566-F:2002.